Journal of Computational Physics | Adam J. Sierakowski, Ph.D.
I’m excited to announce the publication of my new paper, Resolved-particle simulation by the Physalis method: Enhancements and new capabilities, in the Journal of Computational Physics. 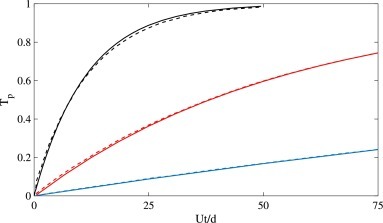 The paper summarizes the theory and numerical methods that I, along with my doctoral advisor Andrea Prosperetti, have refined and developed for the simulation of particles in a fluid flow (think sand kicked up by waves on a beach). The computer code, freely available for download at PhysalisCFD.org, is the first tool that performs such simulations using a graphics processing unit (GPU) as the primary computing engine. By using a GPU, simulations run up to 90 times faster than before, allowing us to simulate thousands of particles in the same amount of time it used to take to simulate ten. We present enhancements and new capabilities of the Physalis method for simulating disperse multiphase flows using particle-resolved simulation. The current work enhances the previous method by incorporating a new type of pressure-Poisson solver that couples with a new Physalis particle pressure boundary condition scheme and a new particle interior treatment to significantly improve overall numerical efficiency. Further, we implement a more efficient method of calculating the Physalis scalar products and incorporate short-range particle interaction models. We provide validation and benchmarking for the Physalis method against experiments of a sedimenting particle and of normal wall collisions. We conclude with an illustrative simulation of 2048 particles sedimenting in a duct. In the appendix, we present a complete and self-consistent description of the analytical development and numerical methods.